Matravius Avent in History Has Its Eyes On You. Unlike most musicals, the story of Hamilton is told almost exclusively in song. So when I first heard that History Has Its Eyes On You: A Hamilton Music Revue would be doing a concert featuring the music of Hamilton "but none of the songs with plot," I wasn't too sure what to expect. It turns out, the Stateside Presents performance didn't have any trouble celebrating the music of Hamilton without veering into the story behind the music. They focused instead on songs (from the musical, the Mixtape and the Hamildrops) that people can resonate with today; songs about love, lust, parenthood and the endless and revolutionary impact of immigrants. The show isn't a performance of the musical, but a celebration of the timeless themes and transcendental music—and performed on a stunning level, of course. Singer Alyssa Chiarello at one point delivered a note so impressive—so high, held for so long, so beautifully—that her castmates essentially stopped the show to congratulate her on it, and to have the audience do the same. Alex Ncube and Eddie Maldonado's love for the music they were performing was palpable in the audience. Ncube dedicated a touching rendition of "Dear Theodosia" to her daughter and demonstrated special appreciation to the lyrics about inclusivity. Meanwhile, Maldonado delivered every single one of his lines with a brash smirk one would believe of Alexander Hamilton himself. And while Maldonado did perform many of Hamilton's lyrics, the cast didn't stick to dedicated roles. Sean Mullaney, whose high-energy performance was definitely a crowd pleaser, represented Schuyler's baby sister "Peggy" in one song, and transitioned into George Washington's commanding role in the next. Matravius Avent mastered both the calm, measured tone of Aaron Burr's opening lines and the tremendous speed of Marquis de Lafayette's rap in "Guns and Ships." 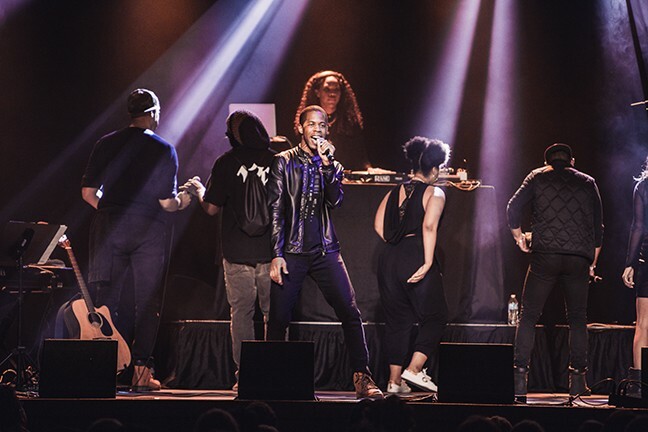 The organizers of the show said from the beginning that they wanted the show (much like the original musical itself) to be a tribute to hip hop, and that was apparent in the room before the first note was sung. The performers ditched Hamilton's typical 1800s garb for leather and mesh. They substituted Hamilton's full orchestra for DJ Kim E. Fresh and a modern band. During "Cabinet Battle," the cast transitioned their rap battle into a dance off, which segued into a kind of break dance intermission. These steps took the much-loved music and transitioned it seamlessly into a show that stands apart from the original work it honors. The show accomplished the goal it set out with: To celebrate the music of one of the most-loved modern musicals outside of the original (high-priced) theater setting. I sincerely hope this show returns to Tucson, because it is a hell of a good time.